John Crane’s Aura 120 Narrow Section gas seal reduces methane emissions by up to 95%. 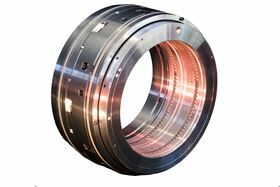 International rotating equipment specialist, John Crane, has announced the launch of its latest gas seal technology, which is designed to be retrofitted into centrifugal compressors with oil seals and cuts operating costs, improves reliability and reduces methane emissions by up to 95%. In the natural gas sector, centrifugal compressors equipped with oil seal technology are generally acknowledged as the leading source of methane emissions offshore and the fourth most significant onshore. However, gas seal technology eliminates the need for oil lubrication associated with contacting seals and the resulting need to address the harmful emissions trapped in the oil. John Crane’s Aura 120 Narrow Section gas seal enables the latest gas seal technology to be fitted into a larger percentage of older equipment, giving it the benefit of a non-contacting design. The company has developed a lifecycle cost calculator (LCC) that provides a full analysis of the economic case for retrofit from oil seals to gas seals against the next best alternatives. The company’s LCC takes operational data from rotating equipment and compares the total lifecycle costs of the oil seal operation, including emissions, with the option of capturing the methane and routing it to a flare device, capturing the methane and routing it for another purpose, and retrofitting to gas seal technology. Earlier this year, John Crane was invited by a United Nations (UN) panel to showcase how the firm’s technology is reducing methane emissions in sectors of the natural gas industry. The panel is examining the critical role gas will play in achieving the UN’s Sustainable Development Goals.